The Golden Dental Solutions brand and clinical solutions are the result of a third-generation family dental business that began at 115 State Street in Detroit Michigan in 1936 with Dr. Milford Golden opening his first dental center. In 1971, Dr. Milford Golden was joined by his son Dr. Richard Golden who had recently graduated from the University of Detroit Mercy School of Dentistry. Dr. Milford Golden practiced at 115 State Street from 1936 through 1980. Dr. Richard Golden continued to serve the city of Detroit at this office location until 1985. In 1979, a State law was passed allowing for dentists to expand advertising methods and to operate multiple offices, which were greatly limited prior to 1979. As an innovator and market leader, Dr. Richard Golden took advantage of this change. During the years of 1985 through 1995 Dr. Golden opened twelve other Dr. Golden Dental Centers in the Metro Detroit area, as well as several other offices in Lansing, Flint and other locations in Michigan. Dr. Richard Golden was the first dentist in Michigan to open and operate multiple offices, as well as the first dentist in Michigan to advertise his services and offer a “guarantee” on his work. Group practices are very popular now, as well as dental advertising, but it was truly innovative and revolutionary to be doing what Dr. Richard Golden was doing in the early 1980s that lead to many changes we see in dentistry today. Dr. Golden actively worked at each of these locations and was passionate about teaching other new dentists he hired how to practice dentistry and to effectively operate a dental practice from a business perspective. Based on these innovative practice methods, the Golden Dental Centers became very well known, as well as very busy in terms of the volume of patients. Another contributor to the exceptional growth that lead to the Golden Dental Centers was the introduction of dental insurance to the United Auto Workers (UAW) in the mid-1970’s, where for the first time such UAW employees had dental insurance coverage. Almost overnight, there were many thousands of patients that were now making regular visits to the dentist. The Golden Dental Centers were a popular choice for these new patients. To increase office efficiencies to be able to see the large volume of patients, Dr. Richard Golden began to closely analyze the typical methods dentists performed procedures and realized the conventional methods and instruments available were quite antiquated for several procedures. Extractions, in particular, were one primary area he focused on and he was determined to improve the predictability of extractions. After many years of operating several dental centers Dr. Golden decided he could better serve his loyal patients from Detroit and focus on new product development by selling the Golden Dental Centers. In 1995, he opened a new practice at 18525 Moross Road in Detroit where he continues to work at today six days a week just celebrating his 20th year at this location. At this location, Dr. Golden further studied the techniques of performing extractions and his most notable breakthrough was the discovery of applying the power and predictability of controlled leverage to the extraction procedure. This resulted in the development of the Physics Forceps atraumatic extraction system that was launched to the dental market in 2007 and the formation of Golden Dental Solutions. 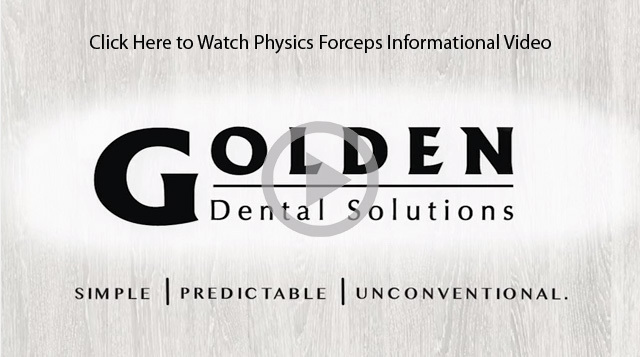 Golden Dental Solutions, a Detroit based company, is the direct seller of the Physics Forceps and several other unconventional and innovative dental products. Golden Dental Solutions is currently operated by Jackie Golden, Dr. Richard Golden’s daughter, and remains a family dental business relying on eighty years of family dental knowledge and experience to manufacture and design products that clinically work. Beyond the Physics Forceps, Golden Dental Solutions has been behind other clinically effective and unconventional dental products including the WAMkey crown and bridge removal system, the MD Guide implant spacing system that combines a pilot drill and surgical guide into one product and the VibraJect injection comfort device to just name a few. Golden Dental Solutions maintains active involvement in continuing education and is extremely proud of the ongoing commitment to training other dentists who wish to excel in the use of advanced dental techniques. Including extraction classed and grafting classes on live patients. Golden Dental Solutions has around 12 hands-on live patient training programs each year in conjunction with the university of Detroit mercy school of dentistry. These extraction courses have been very popular and have been attended by dentists from all 50 states.